The discovery of the Heartbleed security flaw is the latest in a long string of bad news about the vulnerabilities of digital data. The bug, which affects a widely-used encryption technology that is intended to protect online transactions and accounts, went undetected for more than two years. Security researchers are unsure whether or not hackers have been exploiting the problem, but the scope of the problem is estimated to affect up to 66% of active sites on the Internet. 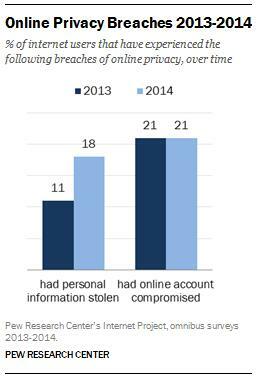 In PEW’s survey last year, it found that 7% of online adults ages 18-29 were aware that they had important personal information stolen such as their Social Security Number, credit card or bank account information. 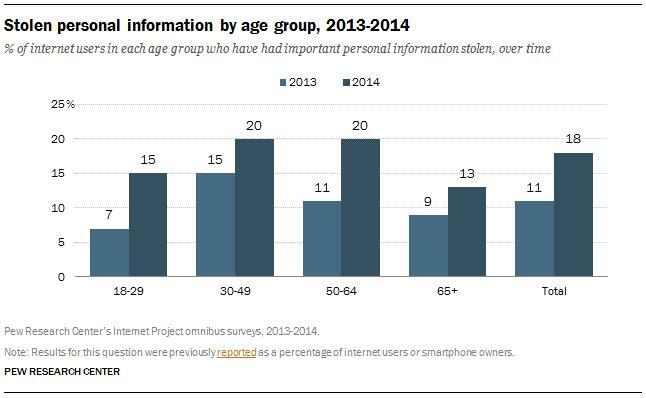 The latest survey finds that 15% of young adults have experienced this kind of personal information theft. 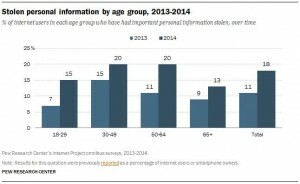 Similarly, those ages 50-64 became significantly more likely to report that they had personal information stolen; while 11% said they had this experience in July, that figure jumped to 20% in January. Increases among other age groups were not statistically significant.